Popcorn is my favorite snack. FAVORITE. Popcorn is why I despise going to the movies - I will eat the entire bucket of popcorn, feel kinda gross and wish I hadn't gone to the movies. My work serves popcorn as a meeting snack option - it's the best option. It's my favorite option. Apparently there used to be a popcorn specialty shop in Ventura, CA and I missed it. WHY?! HOW?! Lame. Anyway, I love popcorn. So does my toddler. When he's having a fun day and wants to do something special, he'll ask to build a fort, make popcorn and eat popcorn in the fort. I love him more than popcorn. 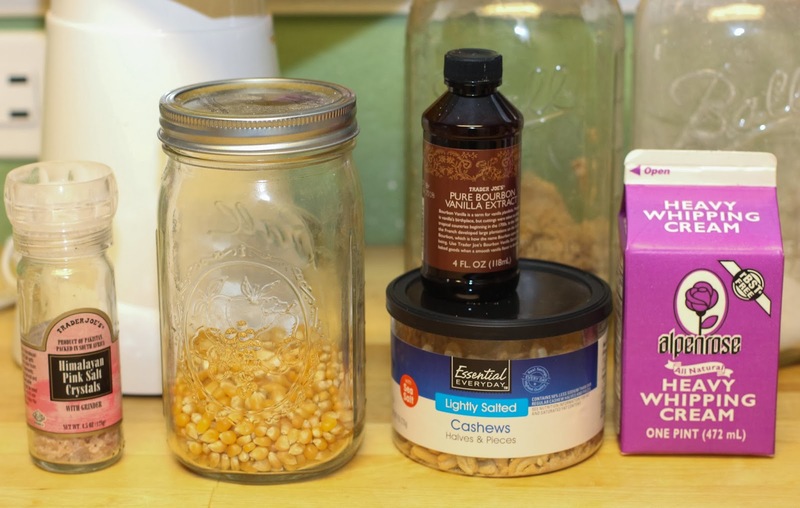 This caramel popcorn is super easy. I don't have a candy thermometer. I've never had a candy thermometer (meat thermometers = germ killing safety. Candy thermometer = $4 I haven't spent at Bed Bath and Beyond.) I've made a lot of peanut brittle and caramel sauces before and I just go by color and smell. It works for me, but the recipe below includes recommended temps if you happen to have a candy thermometer. Serves 1-12 depending on popcorn obsession levels. Pop popcorn and set aside. 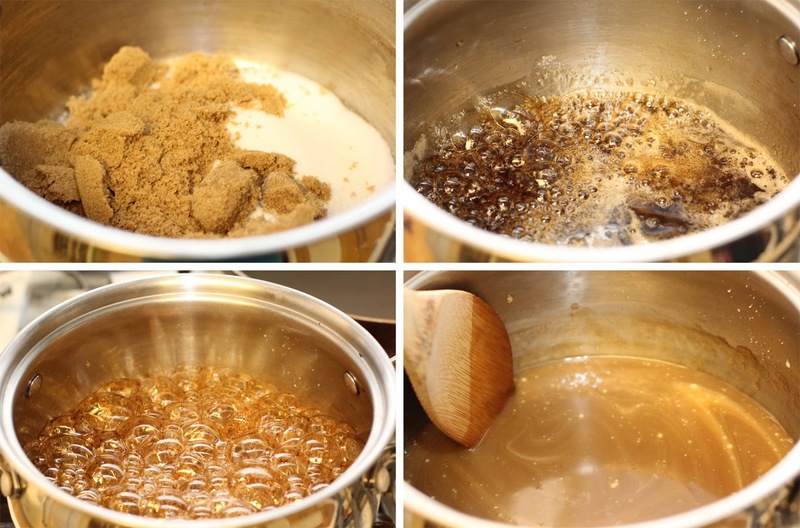 In a heavy bottom pan, melt sugars and water over low heat. Don't stir, just give the pot a swirl every once and a while. When mixture starts to boil, increase the flame to medium and boil for 5 minutes. (I set my kitchen timer and don't go past 5 minutes.) Do not stir, but swirl the pan regularly. Turn off the heat and carefully add heavy cream and vanilla. The mixture will bubble like crazy. Stir and return to very low flame heat. Stir until mixture is smooth and creamy and beginning to simmer. Voila! Caramel sauce! Let the sauce cool some before adding to the popcorn. 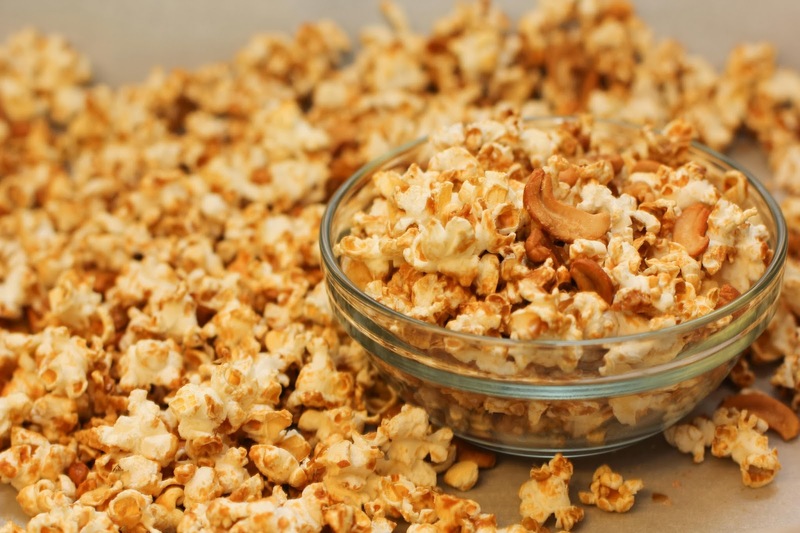 Line a baking dish with parchment paper and spread popcorn evenly over paper and salt generously. Bake at 300 degrees for 30 minutes, stirring every 10 minutes. Let the caramel popcorn cool and then eat. Any leftovers store really well for 2 full days. 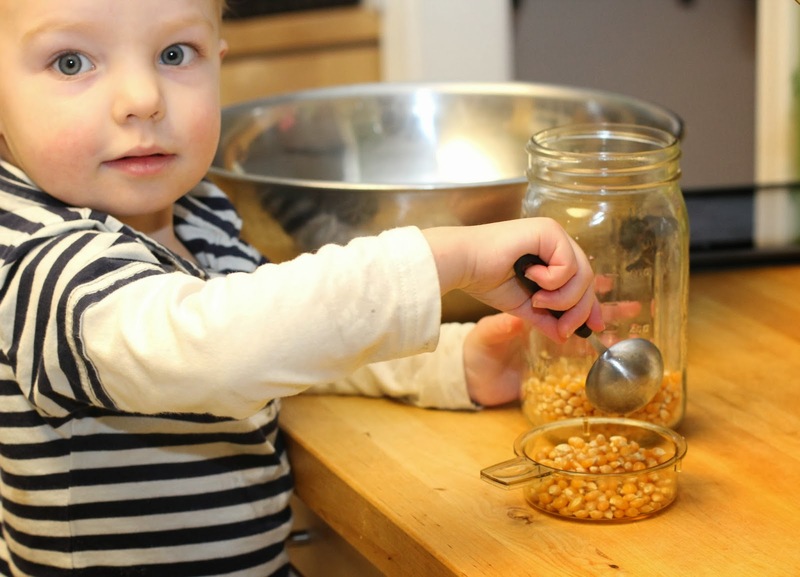 But it's super easy to make popcorn on the stove top with nothing but kernels, a bit of oil and a pot with a lid. In a pot with a lid, add enough vegetable oil to just cover the bottom of the pan. Add enough kernels to be a single layer of kernels over the bottom of the pan. Cover and cook over medium heat, shaking the pan frequently until popping stops. 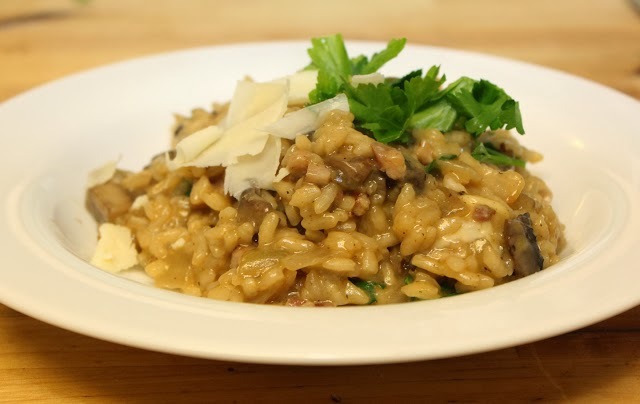 Creamy Risotto with Pancetta and Mushrooms - we are totally having this for dinner tonight!! Yippee! !